When we consult our doctors about a cut, bruise, or potentially fatal concern, we have the expectation that our doctor will either resolve the problem or provide the necessary information to ease our concerns. Of course, when the news isn't pleasant we can at least be thankful to know the truth. Although some prefer not knowing about bodily issues, perhaps we all can agree that we would all like to know how we can easily prevent lung cancer. Unfortunately, many people are unaware of the facts about lung cancer. It isn't just another cancer, it maintains an astonishingly high amount of deaths each year and isn't just a self-inflicted disease. Don't drift off, it's true. It's caused by more than just smoking. Dr. Leach, a leading lung specialist, has fortunately expressed his concerns and advice regarding lung cancer and ways of preventing this deadly disease. 219,000 - People in U.S. diagnosed each year. 160,000 - Lung cancer deaths a year-- more than breast, colon and prostate COMBINED. $1,675 - On research per lung cancer death, 4 to 18 times less funding than others. 20,000 - 30,000 - Lung cancer patients who never smoked. These numbers may come as a surprise to most. What's more surprising to you-- the number of deaths each year amongst nonsmokers or the data comparison amongst other cancers? Research helps. It's clear. The money that goes to researching colon, breast and other cancers has been improving survival rates and bringing hope to the hundreds of thousands suffering from such diseases. Where there's hope for these people, there's little hope for those with lung cancer. Lung cancer has the worst survival rate at 15% which can be compared to the 77% survival rate for breast cancer and 50% survival rate for colon. 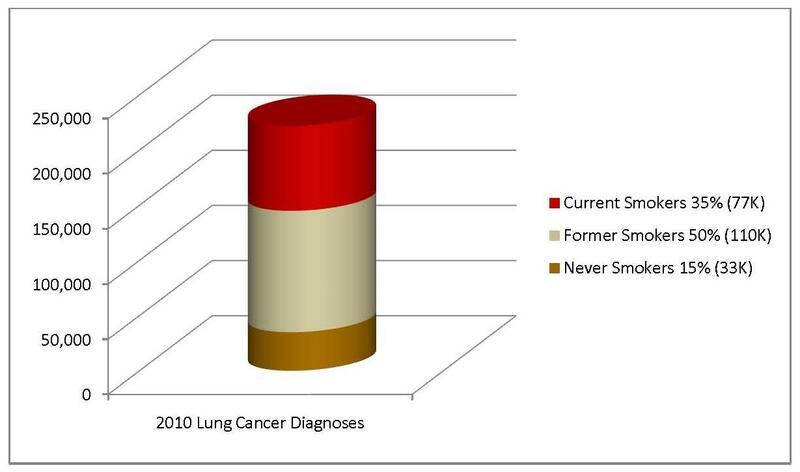 These percentages coincide with the amount of money devoted to the respective cancer. There's $18,658 spent per breast cancer death, $13, 666 per prostate cancer death, and $5, 292 per colorectal cancer death. These figures don't even compare to the $1,675 per lung cancer death. So why the vast difference in research and funding? Well, it's kind of a circular effect. Most people don't want to fund what's considered a self-inflicted disease. Unfortunately those 20-30,000 non-smokers have to suffer alongside the "self-inflicted." In addition, most researchers and doctors prefer to work where there's funding, so the outlook on this cancer needs to change and doctors need to consider how they can help the many battling this disease. Oh, one more thing. The people in this group of non-smokers that die from this disease actually amount to more than the deaths from leukemia, ovarian cancer, or AIDS. How are so many people suffering when they haven't even smoked? Something doesn't add up here. Dr. Joseph Leach works at Virginia Piper Cancer Institute as the medical director. He's also a part of the thoracic oncology program at Abbott Northwestern Hospital. As his specialty is lung cancer, he serves as an advisor to the MN Department of Health on radon. Radon? What does radon have to do with this? Radon is the leading cause of lung cancer amongst nonsmokers. It intoxicates our homes without our knowing. We cannot notice it because it can't be found using any of our senses. Since there isn't much funding or research being done, there aren't any tests such as the mammogram to help in the diagnosis. Most people don't know they have this form of cancer because it doesn't have many noticeable symptoms. Where Dr. Leach lives, in Minneapolis, it's been estimated that one in three homes has high risk levels of indoor radon levels.